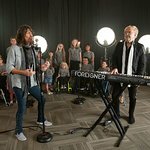 Foreigner and the Grammy Foundation have launched a Public Service Announcement campaign in support of music education! High schools across the United States. can submit a 15-30 second PSA stressing the importance of music in schools and the great music teachers who have encouraged them along the way. • Who was the music teacher who inspired you? Why was he/she so inspirational? • What was the most important lesson about music you learned? • Why is music education important? • What are your memories of your first music teacher? • What would you say to other kids who want to pursue a career in music? Schools should upload their entry to YouTube and email the link to psa@grammy.com. The program runs from now through Oct. 31, 2013. One winner will be chosen by the band and will receive a $10,000 grant for use in their music and audio/visual departments. The winning PSA will be posted on GRAMMYInTheSchools.com.